I completed my PGCHE through the University of Huddersfield in July 2017. An edited version of my reflective portfolio can be found on my teaching in libraries blog. I completed my MSc in Information Studies and Library Management with Northumbria University in September 2014. My dissertation focused on team working within FE libraries. I am one of the co-founders of LISDIS, the conference focusing on the presentation of Masters level research in Librarianship and Information Science. The first LISDIS took place on 14 November 2015 at the Heritage Quay, Huddersfield. LISDIS 2016 took place in UCL on 5 November 2016. I wrote a blog piece for CILIP about the feelings behind this conference’s creation, and my write-up of the conferences appeared in CILIP Update December 2015 and 2016. In November 2016 I joined the LILAC conference committee as Sponsor Relations Officer. I am Treasuerer of the Academic and Research Libraries Group for Yorkshire and Humberside. I presented on Lesson Planning at the NLPN Info event in November 2017. A write up of this event can be found on their website. In September 2017 I presented on research performed in conjunction with Academic Skills Tutors at the University of Huddersfield, at their Teaching and Learning Conference. I presented on collaborations between librarians and academic skills tutors in creating interventions for better critical reading and writing at LILAC 2017 in Swansea. I also took part in the Lagadothan, which I blogged about for the Information Literacy Group. In March 2016 I presented a short paper with Andrew Walsh at LILAC 2016 in Dublin, on the collaborative educational workshop project Transfrom It! My video diary of LILAC can be found on my YouTube channel…see below for an extract. On 20 July 2015 I presented at the Subject Librarians: time for a fresh look? Conference at the University of Hertfordshire alongside my colleague Penelope Dunn. Our talk was on Creative Practices within the University of Huddersfield. On 10 June 2015 I presented on teaching in FE at the CILIP ARLG West Midlands Librarians As Teachers Conference. I wrote a blog piece for CILIP about the subject of this presentation in April 2015. In January 2015 I presented on Literacy Through Stealth, promoting reading for pleasure in academic libraries, at Leeds City College’s Festival of Learning. 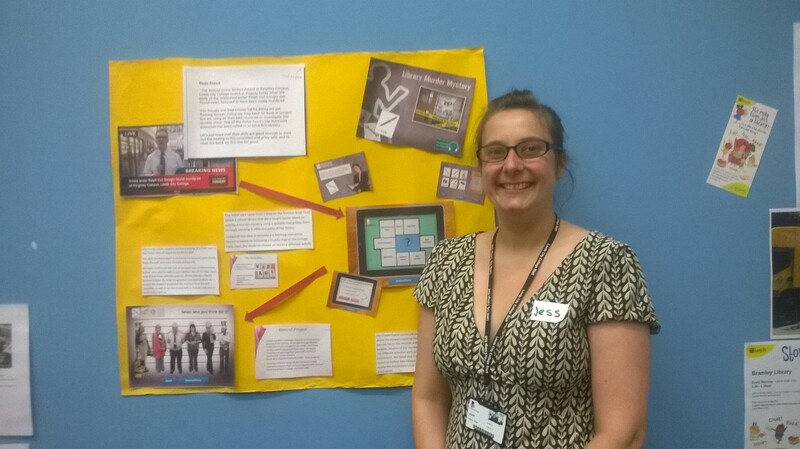 In July 2014 I submitted a poster for display at the CILIP Yorkshire and Humbership Members’ Day, at the Leeds Art Gallery, on an online Information Literacy resource I had produced through my work in FE. In April 2014 I presented a short paper on Information Literacy on a Shoestring at LILAC, looking at creating resources using a ‘whole team’ approach. My Google Scholar profile can be found here . I was admitted to the Register of Chartered Members of CILIP in April 2016 I (sporadically) blogged about my Chartership process, as well as being an active member of the online Facebook support group. My book chapter, Teaching the Teachers: The Value of Information for Educators In Disciplinary Applications of Information Literacy Threshold Concepts, published by the ALA, is available through the University of Huddersfield repository. I was a prolific book blogger before my professional career, and I now regularly review books for CILIP Update, and have reviewed books for the Journal of Information Literacy and the Journal of Radical Librarianship. In October 2014 I was sponsored by UKieG to attend the CILIP New Professionals Day. My report of the day can be found in the December 2014 eLucidate journal. In December 2013 I compiled the Radical Library Camp zine, which can be found on the Radical Library Camp tumblr and wiki. I am currently Subject Librarian for the School of Education and Professional Development at the University of Huddersfield. Between February 2010 and March 2015 I was Assistant Librarian at Keighley Campus, Leeds City College, and then Subject Librarian for Health and Care, and Education at Technology Campus, Leeds City College. Between January 2008 and January 2010 I was a Library Assistant at Leeds College of Technology (later Technology Campus, Leeds City College).